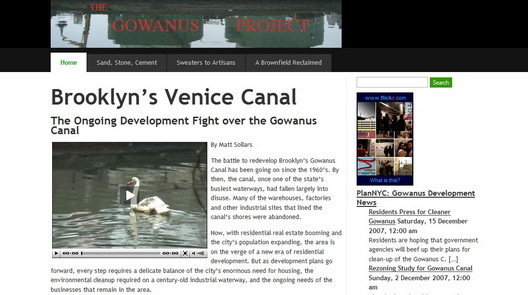 Writer Matt Sollars emailed us to bring our attention to a fascinating site about Gowanus and the Gowanus Canal that he put together as part of work on a Masters Degree at the CUNY Journalism School. It includes some interesting vids about different Gowanus issues, including a particularly fascinating one about the Ferrara Brothers concrete operation. The plant has been there since 1969, but the land was taken by the city via eminent domain in 1974. Now, the plant would have to go as part of the Public Place development plant, although the owners have appealed to the city to have a place in the "new" Gowanus. (At one community meeting, we heard the owner make his case directly to Planning Director Amanda Burden.) The concrete it provides is key to a large number of downtown Manhattan building projects, including redevelopment of the World Trade Center site. The Gowanus location is key as there is a "ninety minute rule" in the concrete business that means the product has ninety minutes to make it to a construction site before it's rendered useless. The are other interesting vids too, including one on a sweater manufacturer that is becoming shared space for artists, one on Public Place and Gowanus artists, one on the general plan for Public Place and an interview with Buddy Scotto about his belief in a Riverwalk-type development the need for higher density in Gowanus. This is a really thoughtful, well-done look at some of the issues in Gowanus - thanks for highlighting it. The video of Buddy Scotto is priceless.